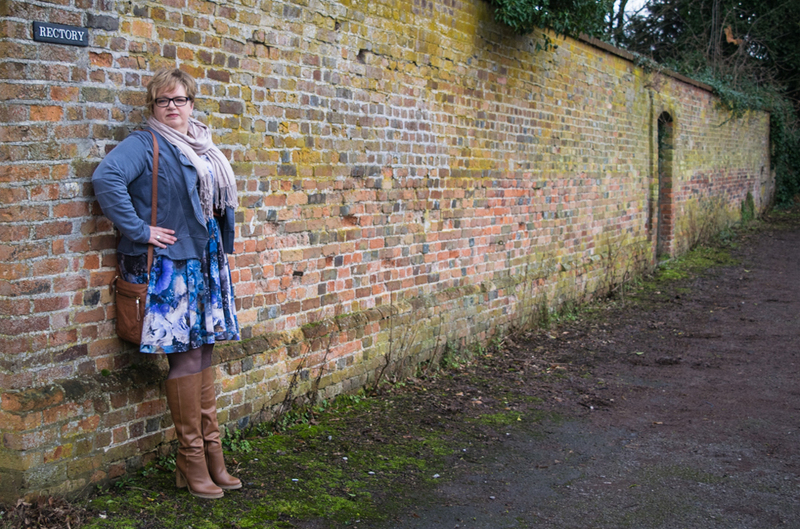 You are here: Home / Community Discussion / Curvy Opinion / 7 ways to get your “sewjo” back! Anyone who has been sewing for a little while will know that sometimes life can get in the way of creating. Usually this is over a busy weekend, after a crazy week or two at work, or often after burning yourself out with a lot projects (especially if you’ve sewn a few things in a row you’re not happy with). These sewing “blips” are part of the making process and generally pass very quickly – you fall easily back into your old sewing stride. Sometimes, though, despite your best intentions, this feeling stays. 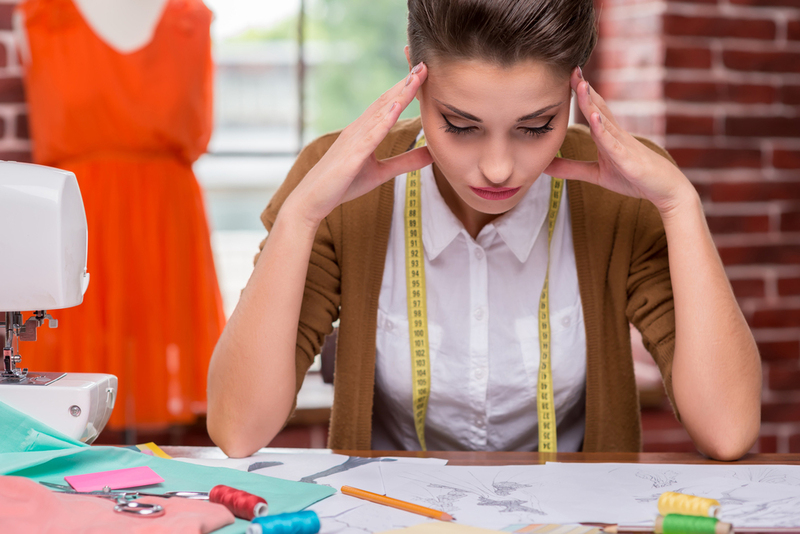 Illness, grief, depression, stress … all of these kinds of life happenings can have a lasting impact on your creativity and rob you of your sewing mojo. Recently, I had a sewing hiatus of my own. Last summer was busy and then the autumn saw additional out of work projects that seemed to eat time, I also had lots of work stress and long hours followed by losing a friend. Before I knew it, November was here and I realized I hadn’t made anything in weeks. Worse still, the further away I got from my last sewing session, the harder it seemed to be to start again. My sewing shed had turned into a mini dumping ground and in the midst of the chaos I felt totally uninspired. Now I don’t know about you, but when I don’t sew for a period of time I get really tetchy. The force is strong in sewers and all that creativity needs somewhere to go, otherwise it starts to drive you crazy. I knew I needed to take action. I turned to my fellow sewers and via a blog post asked for suggestions on how to escape my sewing wilderness. Their answers were funny and kind, thoughtful and inspirational. And you know what, they really helped. I started working through their ideas and somewhere along the way my sewjo magically returned. And then … then I actually MADE something! Ahh, the relief was palpable. It wasn’t amazing or groundbreaking or perfect, but it was a start and my enthusiasm for sewing has continued to return. So, without further ado, for those of you lost in your own sewing wilderness, here are the words of wisdom I would like to share. Big life changes require time to adjust. Particularly when you have experienced loss or grief it can feel impossible to find your creativity again. You will need time to recharge and heal, and if that means that all you want to do is curl up on the couch under a blanket for a few months then so be it. Now is not the time to put pressure on yourself because it will just make you feel worse, and make your return to a creative place longer. Or coffee, or a double G&T … whatever floats your boat. What you are aiming for here is to spend some time looking at things that might inspire you. It could be anything, from interior or gardening articles to browsing crafting websites, magazines to books. The idea is to find visual cues to awaken your creative spark. 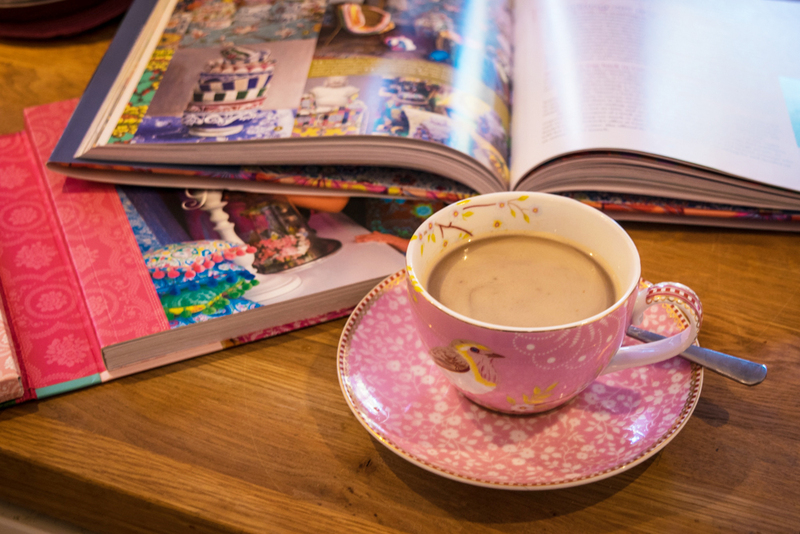 My “go to” book for inspiration is Kaffe Fasset’s Dreaming in Colour – full of photos of textiles and landscapes and amazing colour combinations. It always fills my mind with potential every time I look at it. Pinterest is also a really good place to find beautiful things that make you creatively excited. Sometimes its good to have a break from sewing and try something new. 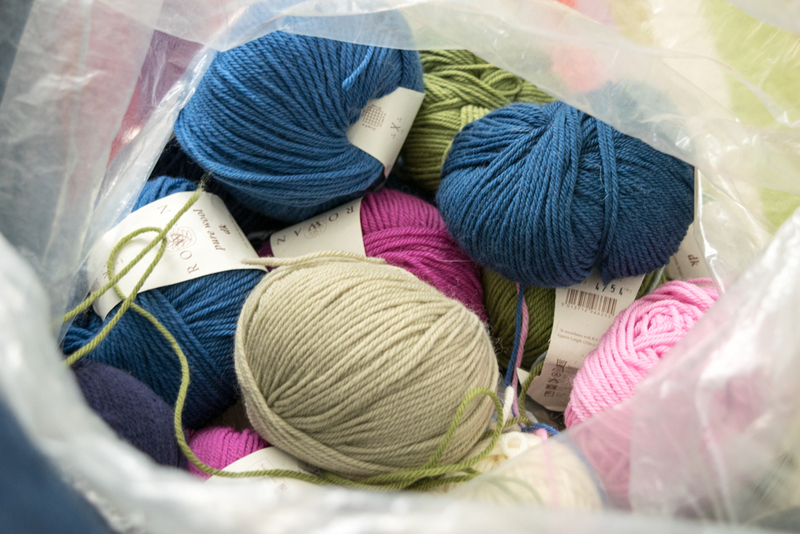 Have you every fancied trying your hand at knitting or crochet, jewellery making or zentangle? Thinking outside of the box and trying a different craft for a while can be a key step in rediscovering your love of making things. 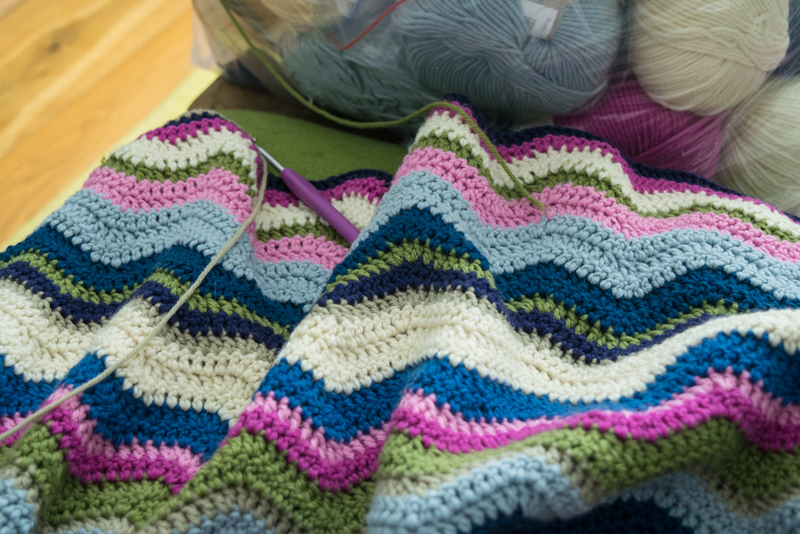 For me a large bag of unused yarn turned into a really simple crochet ripple blanket. Once I learnt the basics it was really easy to do and I loved the colour combinations and the steady rhythm of the piece. It was the perfect crafting palate cleanser. Even if you only have time to do ten minutes tidying a day, having a clean and tidy space to be creative in works immensely. This was one of my greatest roadblocks in my sewing wilderness as my sewing room had become a bomb site. 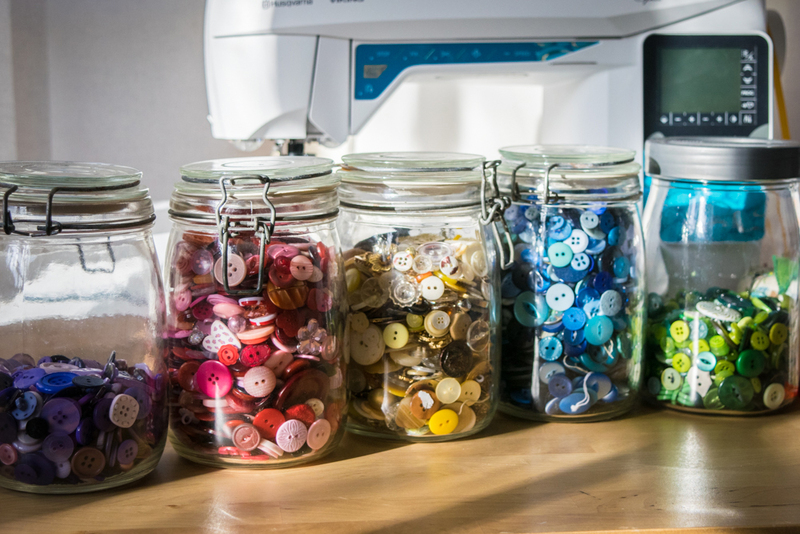 Use the sewing down time as a great opportunity to get everything in order … sort out buttons, get rid of things you don’t want anymore and declutter. I found this one of the most therapeutic steps and it didn’t take nearly as long as I feared. Finally, I could see my stash in all its glory! Once everything is properly ship-shape it’s a really good idea to while away an hour or two looking through your stash or browsing patterns that take your fancy and see what happens. I found some lovely patterns I totally forgot I had that would be ideal for Spring and I mixed and matched them with stash fabric and immediately found two or three new things I thought would make wonderful projects. Meanwhile several bags of unwanted fabric and patterns were donated to charity – a great opportunity to get rid of the disastrous fabric I had bought in cut price sales. My first make back at the sewing machine was a TNT Lady Skater – a pattern I love and have ironed out all the fit issues with. It’s also a knit dress so runs up easily on the overlocker. Be kind to yourself if you are returning to sewing after a long break. Choosing a first project that’s too difficult or with major fitting issues may set you back further and cause you to lose confidence. 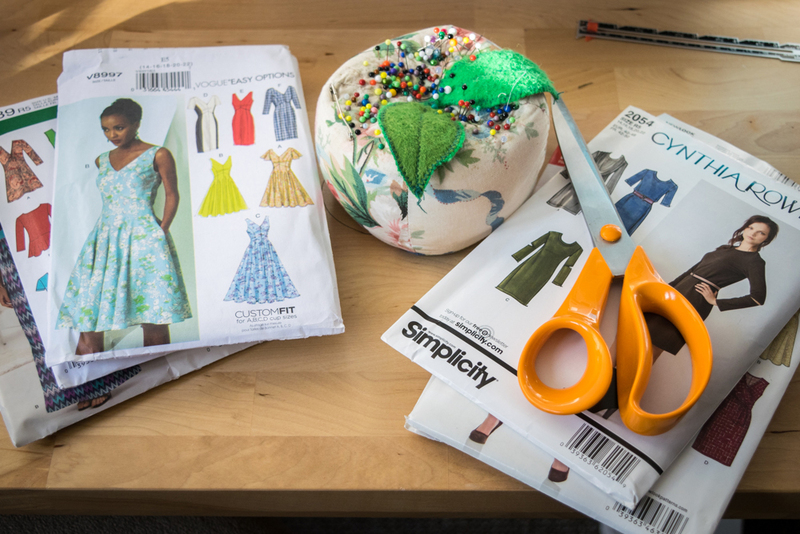 Consider hand sewing something with all your scraps and leftover fabric. There are some wonderful pincushions and little purse patterns available on Etsy or free on sewing blogs. Sew-a-longs, sewing competitions, themed sewing months, while community led projects can be great fun, if you over commit they can often make you feel like you HAVE to sew. Worse still if you also find yourself sewing lots of gift projects in the run up to holidays or birthdays. Try and pick and choose only those projects you really feel a connection with and the rest of the time sew things only because you love them. Be realistic about the time you have available to sew and don’t put yourself under pressure. Most of all, take your time and enjoy the making process, even the toiles. Sewing more leisurely is a much nicer experience and is almost always likely to result in better finished garments. Although I am sewing again I am still in the baby steps of returning to my full on sewing potential. I still have time issues I need to sort out, I need to stop overcommitting and I’m determined to develop a less deadline driven attitude to my sewing. None of those things help my creativity in the slightest, but by being aware of what led me to my sewing wilderness I hope to bypass it next time life gets in the way. Lastly, I’d like to thank all those wonderful readers who took time to share their tips. I hope that this post helps those of you experiencing a sewing slump as much as the suggestions helped me. « The CSC: onwards and upwards! I have also lost my sewjo, love that a word, after my daughter miscarried recently ( a long awaited and hard won IVF pregnancy) but I love the idea of just letting it go for a while. I have been busy with the allotment and looking after my daughter and that is enough. I sew in my lounge so have to look at the mess or just feel all that fabric is staring at me even from the drawers so my first priority is to clear up and get rid of anything that I’ve had for ages and I feel I ought to use up. One idea my daughter had some years ago when I was unwell was to go through my stuff and make up little projects into bags or boxes,; fabric, buttons, threads, shells, beads, lace etc with a picture with it for inspiration and/or a book reference. ( I am an embroiderer as well as dressmaker). Then when I felt I could sew, I didn’t have to think about what to sew. We had such fun making these parcels up and I enjoyed later making up the projects. Thank you for your blog. I’d like to thank you for posting this article. I have been suffering from depression for the past few years and had a rather bad bout about 4 months ago and have struggled to push myself to sew. I like the fact you say it’s ok to not sew atal if I don’t feel ready and that’s where iam at the minute but I’m enjoying looking through my stash and coming up with ideas when I feel ready again. 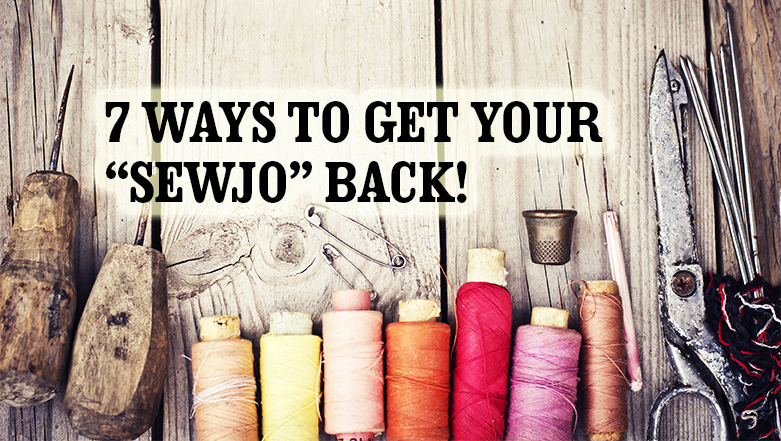 These are all fantastic sewjo boosting tips. T, I’m so glad you’re getting back into sewing. Fabulous article, thank you. I started the year telling myself I would do household chores on Thursday evenings then the weekend would be free to sew/craft if I desired. My biggest roadblock is feeling guilty pursuing my passions when the house is messy, even though I try to convince myself that only boring women have immaculate houses:-) Your tips are fantastic. That seems to be wear I am at now. I started working overtime on Jan 2 and boy has my creativity suffered. I now have three projects that I need to complete and refuse to look at my fabric until I have time. I don’t get home until late so I’m not in the mood to “prep” my project I want to sew. I just don’t fee like it and it make me sick. Now that the over time is over, I’m trying to get back in the mood and lI ook at the two cardigan everyday in the bags I put them in, yes they are calling my name so I just maybe I will be able to hang out with my sewing machine soon. Good post. I’ve been spending time in my sewing room – just hanging out. I’ve been making things that aren’t clothing, a small bag, and a wall hanging, while working up to making clothing. CSC has been my inspiration, as well as other sewing blogs which are my top picks to look at, too, for courage to start making the pattern adjustments I’ve been avoiding! So, thank you! Painting my sewing room, which involved taking everything out and then reorganizing it did wonders. Hmm, I didn’t sleep last night because I had decided to review my ‘to do’ list before going to bed – baaaad idea! I like the idea of not overcommitting. Chunk the things into small steps and I must remember if I don’t get something done on time (whose time?) – no one dies! Thanks for this post. Great post, T. I’ve found the best thing for my sew-jo is: not feeling guilty for not sewing, making sure my sewing room is tidy, and getting myself to do small sewing-related jobs that aren’t actually sewing, like tracing off a pattern or cutting out fabric. I’ll often get myself to spend 30 minutes in my sewing room doing SOMETHING, even if it’s not sewing – and it looks like a few others do the same thing! Sometimes the best thing for me is to pick up a slightly more complicated thing, rather than a simple make which I’m more likely to rush my way through and make problems. When I lose my sewing mojo; I clean my cave and fondle my stash. I had zero energy to sew this weekend. Sunday I got up and COMPLETELY cleaned up my sewing area, brought a bookcase in, rearranged some things and pawed through my fabric stash a bit. Boom. I cut out and sewed up a (very easy) skirt. Now I can consider projects again. How true. This weekend I finished my first item since June last year. Your post made me reflect a bit and I had thought my mojo went due to pain and a cold winter but having looked back to see when my last lot of sewing was, I think the fact that one of the lovely tunics I made split at the shoulders on the first wear really sucked the mojo out of me too. I am back sewing now and wish all of those with sewjoitis a speedy recovery. Perfect timing! I just spent most of the last 3 days cleaning out the toxic waste site that my sewing room had become and I’m not done yet! For me, a messy room is the worst drain on my creative juices but it gets that way much too often. Hopefully I can finish the cleanup after work tonight and be able to sew a few minutes here and there between now and Thursday then I’ve got a couple of days to play. So glad to see you with your SewJo back! I’ve missed your posts here & on your blog, too. Thanks for sharing these great tips, I often have my sewing ‘wilderness’ times due to health problems, so I’m bookmarking this page to come back to next time it happens! Good post! I also go through periods of losing sewjo. I sew garments, home dec and quilts. I find that if I switch towards quilting for a while I can recharge my sewjo faster. Thank you for your tips. I lost my “sewjo” over a year ago due to discovering my mother’s caregiver was scamming her due to her dementia. In addition I have had to move my mom closer to me, from the south to New England, which required several trips back down south to clean out her house, sort through family pictures and find an estate agent to sell the house and the leftover contents. A very emotional experience. Needless to say my “sewjo” has flown the coop. Today’s tips are a lifesaver. It’s nice to know I am not the only one who is coping with life’s ups and downs. I have renewed my interest in knitting as I find it easier to pick up and put down without losing my place but also as way to express my creativity. I have also discovered blogs which lead to finding CSC. A wonderful treasure. I have finally found a “sewing home!” Many, many thanks for this. One day in the future, I will de-clutter my sewing room, organize and sort fabric piles and begin a new project following suggestions from today’s tips. Thanks for lifting my spirits, I look forward to more inspiration. Thanks for posting this. I really needed to read it. My sewing area looks like tornado wreckage and I did spend sometime yesterday cleaning up. It looks better but not there yet. I often set deadlines for myself and get frustrated when I end up with a wadder or don’t meet my deadline. I read another sewing blogger gives herself one hour a day in her sewing room (even if it’s not sewing) and said she accomplishes so much by the end of the week. 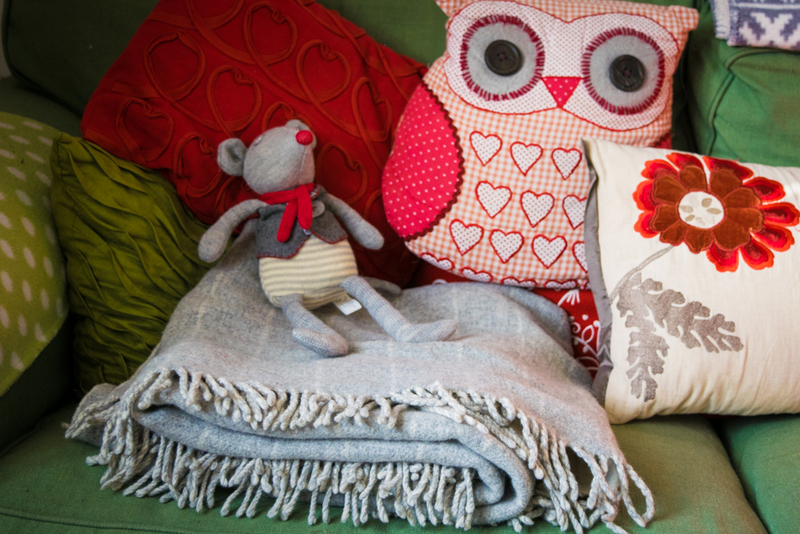 I love sewing and creating–it’s the getting started that I need to get through. These are nice suggestions, for me just cleaning and organizing my sewing room always helps. Glad to have you back. Great tips, T! I also find myself tidying up and organizing my sewing room when I’m in a bit of a rut – and sometimes, tracing patterns too. Then, when my sew-jo comes back I’m thrilled that my uninspired self already did the grunt work!